Feds kicked off opening statements Friday in the insider trading trial of Mathew Martoma, formerly of the hedge fund firm SAC Capital. 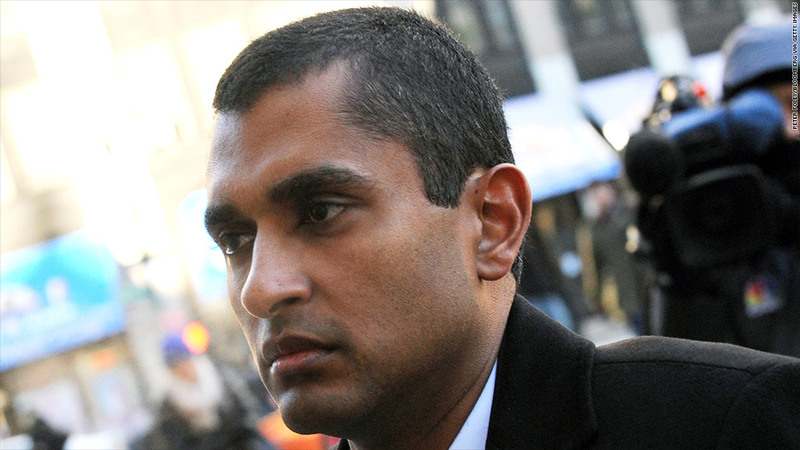 Mathew Martoma, the latest defendant in the government's ongoing insider trading crackdown, is betting he can beat some long odds. Since August of 2009, federal prosecutors have filed insider trading charges against 87 people, and have maintained a perfect record so far. Of the cases that have concluded, 78 defendants have been convicted or pleaded guilty. None were acquitted. Martoma's trial began Friday in Manhattan. He was formerly a portfolio manager at SAC Capital, the hedge fund firm run by billionaire investment mogul Steve Cohen that has become the government's primary target over the course of the crackdown. Seven former SAC employees have already pleaded guilty or been convicted of insider trading charges. The firm itself also pleaded guilty to criminal insider trading charges last year, paying $1.8 billion in fines and agreeing to close its doors to outside investors. Martoma, however, maintains his innocence, so spectators gathered in a packed courtroom Friday to hear opening statements in his case from the prosecution and defense. Martoma is accused of selling and shorting shares of drug companies Elan and Wyeth after illegally obtaining information about confidential results of a failed Alzheimer's drug trial in 2008. The feds allege that Martoma used his inside information to convince Cohen to buy $700 million worth of Elan and Wyeth stock, and then dump it and short it just days before the public announcement of the trial's results. The trades allegedly generated profits and avoided losses for a combined gain of $276 million. Manhattan U.S. Attorney Preet Bharara has called the case "the most lucrative insider trading scheme ever charged." "Steve Cohen had bought Elan and Wyeth largely on Mathew Martoma's recommendation," prosecutor Arlo Devlin-Brown told jurors Friday. Devlin-Brown said Martoma fostered a professional friendship with Dr. Sidney Gilman, who was involved in the drug trials, in order to gain inside information. Martoma allegedly paid the Michigan-based neurologist $70,000 over a series of 40 meetings from 2006 to 2008. Gilman is expected to be the prosecution's star witness. He settled civil insider trading charges from the SEC back in 2012, and will avoid prison time thanks to his cooperation with the government. Martoma's lawyer, Richard Strassberg, argued that Gilman couldn't be trusted in light of this agreement, and will "remember things the way the prosecution wants him to remember them." "Dr. Gilman has a memory that's faulty, and has changed his story again and again," Strassberg said of the Alzheimer's expert. Strassberg also noted that the practice of consulting industry experts for insight into particular companies is common among investment professionals, saying both Martoma and Gilman had conducted dozens of similar meetings with others. "When the prosecution talks about [getting an] edge, that's not something sinister," Strassberg said. "It's what anybody who's investing other people's money should be doing." As for SAC's move to abruptly dump Elan and Wyeth stock, Strassberg said this was standard practice for the firm. "This is a hedge fund -- they make money by taking big positions and selling big positions," he said. If convicted, Martoma could get up to 20 years in prison for each of the two fraud charges he faces and up to five years for a conspiracy charge, though his actual sentence would probably be much lighter. Martoma's trial follows last month's conviction of Michael Steinberg, who was also a portfolio manager at SAC, for shorting Dell (DELL) and Nvidia (NVDA) stocks based on inside information. Steinberg is scheduled to be sentenced in April. Cohen himself has not been charged criminally, though the Securities and Exchange Commission filed a civil suit against him last year accusing him of failing to properly supervise employees who engaged in insider trading, an allegation he has denied.